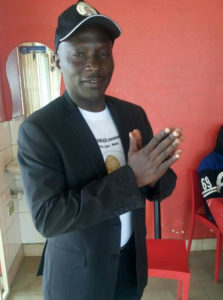 Charles Ziridamu Lubega, the acting chairman of Kyotera district, is contesting as an Independent candidate after losing to Kisekulo in the NRM primaries. Courtesy photo. After sweeping almost all the by-elections and electoral court cases, NRM party is warming up to capture political positions in the five newly created districts in the country. Senior NRM party officials are today expected in Kyotera, Namisindwa, Bunyangabu, Pakwach and Rukiga districts to conclude the campaigns by holding marathon rallies. The five districts will go to polls this Thursday to elect their Woman MPs and LC5 chairpersons. According to Rogers Mulindwa, the party communication officer, President Museveni, who is also the party chairman, delegated the senior party officials to handle the rallies. Museveni is in New York attending the United Nations General Assembly. In Kyotera district, the NRM party has deployed Moses Kigongo, the vice chairman of the party to drum up support for Patrick Kintu Kisekulo and Rachael Nakitende. After being defeated in the NRM primaries, Charles Ziridamu Lubega, the acting chairman of Kyotera district, never conceded. He went ahead to contest as an independent candidate against Kisekulo. Haruna Kyeyune Kasolo, the State minister for Finance, is reported to be backing Kisekulo and he is being accused by Lubega’s supporters of having influenced the outcome of the NRM primaries in favour of Kisekulo. This explains why big shots in the party have camped in the district, fearing to lose because of the divisions. Two days ago, the secretary general of the party, Justine Lumumba was in the district, soliciting votes for NRM candidates. And EALA legislator Mathias Kasamba has also been in Kyotera district for over two weeks now. When Kigongo appears in the district, he will hold two rallies in Mutukula and Kirumba. In Bunyangabu district, Lumumba is travelling there to address three rallies at Rwensenene playground at 11pm, Rwimi Primary School and Kibiti market playground at 4pm. Kirunda Kivejinja headsto Namisindwa to garner support for NRM candidates. Courtesy photo. NRM party is fronting James Ategeka, for district chairmanship seat and Peace Mutuuzo, contesting for district Woman Parliamentary seat. Mulindwa said Adolf Mwesige, the Minister for Defence, was in the area, holding several meetings in the district. “He crowned up the day with a two-hour radio talk show on Dana FM,” he added. Before heading to New York, Museveni assigned Rukahana Rugunda, the Prime Minister to Rukiga, to canvass support for Alexander Kampihako and Caroline Kamusiime. Rugunda is expected to address three rallies, one of theme at Kamwezi sub-county ground. 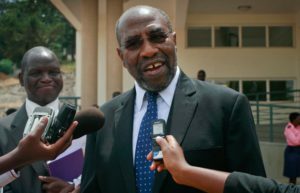 Prime Minister Ruhakana Rugunda is in Rukiga drumming up support for NRM’s Alexander Kampihako and Caroline Kamusiime. The deputy Prime Minister Kirunda Kivejinja is in charge of Namisindwa district. 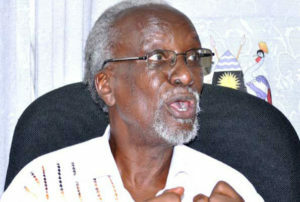 He is expected to hold rallies at Buwasu Primary School in Wabwala sub-county, before connecting to Magale Primary School in Magale sub-county. The party is fronting George Opus and Grace Watua Namuhura. Part of the reason why Kivejinja has been deployed to Namisindwa district is because the area boasts many veterans. “And they are still alive to give accurate narratives of the struggle and historical sites. There was, therefore, no better choice here than Mzee Kirunda,” Mulindwa explained. Mike Mukula, Eastern region NRM vice chairman, is in charge of Pakwach district, marketing Robert Omito and Jane Abur.